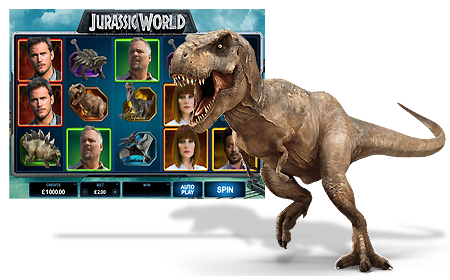 Jurassic World is a 5 reel, 243 ways to win slot from Microgaming that is based on the 2015 blockbuster film. Playable from 30p a spin on all devices, it comes with an Indominus feature which randomly boosts wins in the base game to give you up to 1,000 times your total stake! The Free Spins feature gives you the choice of 3 locations and starts you with 10 free spins – Gyrosphere Valley benefits from a multiplier trail on non-winning spins up to 7x and Creation Lab has Rolling Reels and Cyro Wilds which are frozen for 3 winning free spins. Raptor Den sees scatters as wilds so you can win an additional 5 free spins. There are wins of over 14,000 times your stake on a spin to be won! Jurassic World is a Microgaming slot with 5 reels and 243 ways to win. Created in partnership with Universal Pictures and following on from the original Jurassic Park slot (and film), this branded title has lots of innovative bonus features. It can be played from 30p to £7.20 a spin across desktop, mobile and tablet devices. Visually, and as you’d expect, it has stunning visual effects and reminiscent of the 2015 film which is the 4th highest grossing film of all time! Symbols on the reels include 6 dinosaurs (Velociraptor, Pteranodon, Stegosaurus, Ankylosaurus, Tyrannosaurus and Indominus) as well as 4 characters from the film – Owen Brady (Chris Pratt), Vic Hoskins (Vincent D’Onofrio), Claire Dearing (Bryce Dallas Howard) and Simon Masrani (Irrfan Khan). The Jurassic World logo is the wild symbol which substitutes for all symbols except the scatter – more importantly, wilds appear stacked up to 10 symbols high! The amber-encased symbol is the scatter – if 2 appear in the base game at the same time, they will transform into wilds. When it comes to bonus features, there are plenty. First you have the Indominus feature which is triggered randomly in the base game when you get a win between 3 and 5 times your stake. The Indominus Rex can appear and boost your winnings by up to 1,000 times your total stake! Gyrosphere Valley – you get 10 free spins with a multiplier trail. The multiplier begins at 2x and increases by 1 on each non-winning free spin up to 7x. Once your 10 free spins are gone, the feature continues until you get a win. Creation Lab – again, you get 10 free spins but with Rolling Reels. When you get a winning combination, the contributing symbols are removed from the reels and replaced with new ones. This means you can win again and again from each free spin. You will also benefit from Cryo Wilds which are frozen in place for 3 wins before melting away – if part of a win, they remain on the reels but drop down a row on a Rolling Reel win. 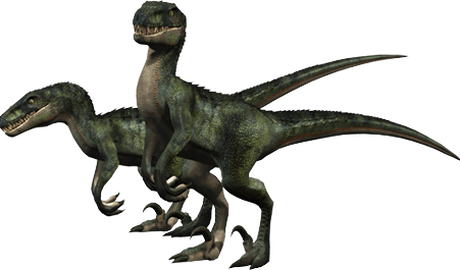 Raptor Den – you will receive 10 free spins and wild scatters. All scatters act as wilds during the feature with scatters held until you are awarded extra free spins. 3 or more scatters will give you an extra 5 free spins taking your total to 15. I really like Jurassic World – it looks fantastic and has superb bonus features. I particularly like the Creation Lab free spins feature as you get the opportunity to get continuous wins with the Rolling Reels as well as frozen wilds for 3 wins. The Indominus feature in the base game also can give you a nice boost up to 1,000 times your stake if you’re luck is in. I consider Jurassic World to be a medium variance game – it does have the potential to pay out over 14,000 times your total stake on a spin which is mind-blowing! Overall, another superb branded release from Microgaming. I would also suggest you try Jurassic Park which is just as good.